Recently an article was published online which touted: “Market for SD Cards to Reach $21.3 Billion by 2018.” It’s not a stretch to conclude that if even only a fraction of this volume was used to store content meant for mass distribution or consumption, then the SD duplicator business will be a very lucrative market in the near future. More and more mobile devices utilize SD or micro SD cards for storage and/or playing content. Additionally, video games and movies are becoming more readily available on SD cards due to the compact size and ever increasing capacity. So with that said, unlike optical discs, there is only one way to copy flash memory and that’s to duplicate it. There is no such thing as replication of SD Cards. Each card has to be individually written to, which means that SD duplicators will be very much in demand! 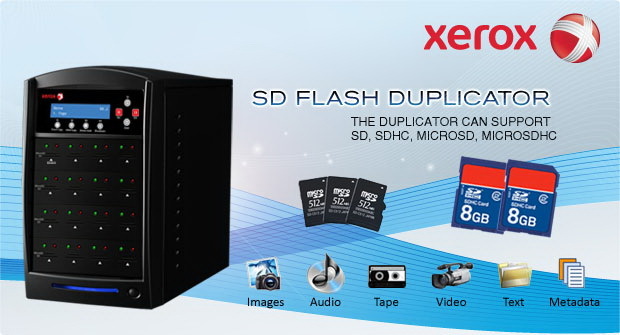 If you want to stay ahead of the trends rather than follow them, invest in a Xerox SD/Micro SD Flash duplicator today. What makes the Sony â€“CB drives the preferred writer drive for the duplication market? 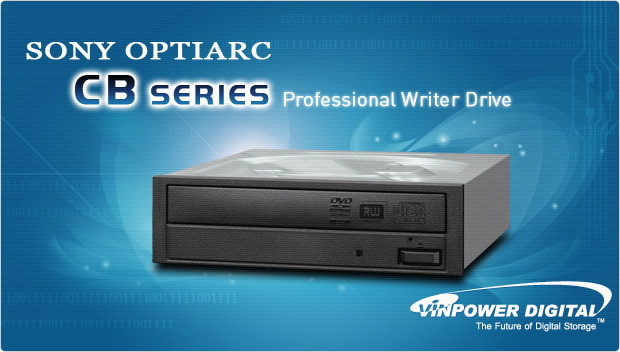 Vinpower has been spreading the news that the specially enhanced DVD/CD Sony Optiarc CB writer drives are better than other models for multi-drive duplication. Many of you may wonder, how we can make this claim, as just looking at the specs, all DVD/CD writer drives look the same. The critical difference lies in both the quality of the components used to manufacture the drive and the proper calibration of these elements specifically for the duplication market. To write to a disc, a drive will use a laser diode that burns digital data onto the reflective side of the disc. Of course, the laser will generate heat and for every degree increase in the temperature, the drive will need to recalibrate the laser diode as to how strong the laser needs to be to write the data onto the disc. The wider the variance in temperature variance, the lower the ultimate burn quality will be. Now with most end users that burn a discs every once in a while, the drive will not heat up enough to make a noticeable difference. However, when it comes to those that frequently need to duplicate discs in large quantities through multi-drive duplication towers, it will make a huge difference. Most standard drives base their burning principals on typical PC usage, so they can reduce costs by not fine-tuning the laser calibration as stringently. This reduction is the attention to detail is recognizable by duplicating a large number of discs and comparing the disc burned 1st to one of the final discs burned and youâ€™ll find multiple irregularities between the two. In the case of the Sony CB drives, Vinpower worked with Sony to determine the absolute best calibration timing and variance so that every duplicated disc will identical in quality and appearance. That is why Vinpower uses the Sony CB drive exclusively for their CD/DVD duplicators.